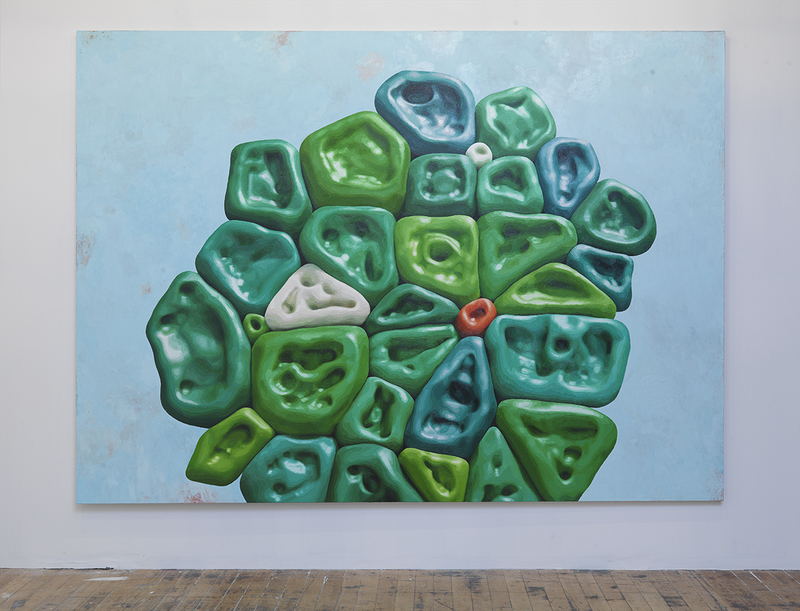 Let’s pretend Alexander Ross’s large paintings of Green Giant green-bean blobby biomorphic forms contain portraits of magnified specimens of metastasizing mutant cellular structures scraped from the skin of one of Alexis Rockman’s futuristic fauna from his Hudson tryptich (Tropical Migrants, 2011), which accompanied Ross’s work in the Sandy exhibition. While gloriously abstract and humorous, Ross’s modeled Plasticine surfaces and vivid cartoon colors evoke the world of the character Gumby or the land of childhood Play-Doh gone biologically haywire. In fact, who knows, maybe Untitled 2007 is in fact a magnification of a slice of Gumby’s pliable green flesh when seen under the microscope. Alexander Ross, “Untitled,” 2007. Oil on canvas, 88 x 120″. Courtesy of the artist and David Nolan Gallery. Photo by Brian Buckley. Ross has a famously labor intensive method for making his paintings, one that suggests the importance of the physical solidity—the sense of three-dimensional space—that carries over into the two-dimensional paintings. He makes his own models, photographs them, and then paints from the photograph. That trippy 3-D presence jumps off the canvas even while these burgeoning science experiments remain stuck in a painterly space. Ebullient, funny, awkward and yet familiar, “His giddy surfaces are icky, sickly, and yet addictive.” 1 The perfect antidote to our post-hurricane blues. 1 David Cohen, “Alexander Ross at Marianne Boesky and David Nolan,” 2008, Artcritical.com.